If Winter is Coming, let it at least be MINT. Anyone remembering my Winter is Coming Haul? Yes? Uhm, truth be told, it didn't just stay there. The next day I was browsing Gmarket again (I terrible terrible and dangerous habit that I have... same with Ebay in Germany or Rakuten when I'm in Japan....) and found amazing things that I needed in my life. Like, a second winter coat although I brought my superthick winter coat from Germany (because I thought, what if winter coats would be expensive? What if I wouldn't find anything? - Yeah, I'm laughing now too...) or boots that look like UGGs but only cost 1/20th of the price? You need those things. When deadly winter hits in Seoul, you will need those things badly. No one is better at convincing me than my inner shopping self. Unfortunately both things -coat and boots- took really long to arrive (for Korean standard at least, where most things are shipped the instant you buy it and arrive at your doorstep the next day,) and when they did... oh boy. The boots I ordered where fine let alone the fact that they shipped me two left shoes. Yepp. Thanks a bunch, very helpful. What the hell am I supposed to do with two left shoes..? How did this even happen,,? The shoes even have buckles, so you see in a second that these two don't build a pair. *sigh I'm trying to exchange it now and get a right shoe so I can wear the actual boots. Long story short; It's a parka with the perfect a-little-over-hip length. It has a gorgeous mint color to make winter more fun because honestly - when real winter strikes, you'll need all the fun you can grab. Plus, it has a giant fake fur hood which is never bad to have. ...of course, when I was wearing this beauty it was the hottest day in two weeks here in Seoul. Two weeks I am freezing every single day in my autumn coat and as soon as I put the fluffiness on it suddenly turns 15°C again in Seoul. Why. Why are you doing this to me.... good thing: This parka is really warm so I can look a bit more optimistic to the months to come. Oh, the shawl you see here is the one I showed you in my haul post. It is super fluffy and quite thick. Overall I am very impressed by the quality of most stores I ordered from at Gmarket... 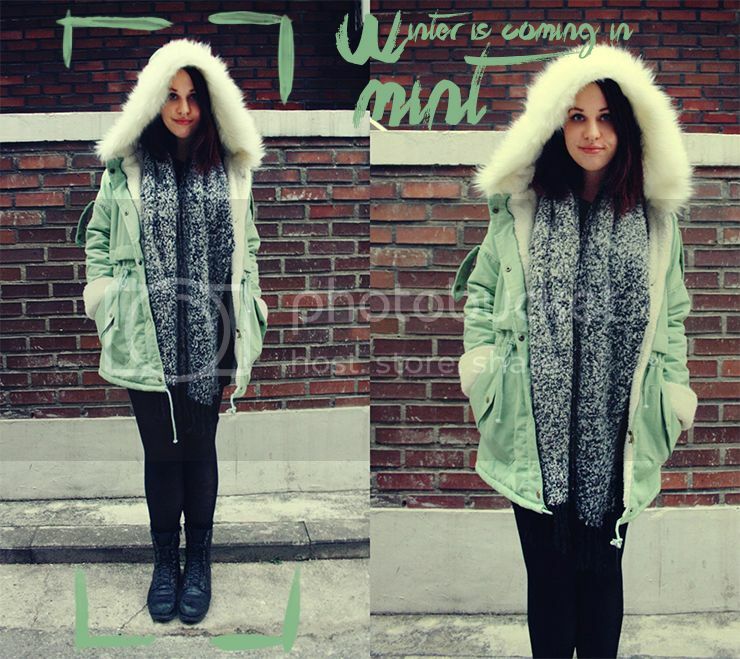 I didn't expect really good quality with these prices - the parka was 42,000Won which is ~30€ - a steal if you ask me! In Germany, the same coat would probably be 60€ or higher if it was made by a fancy brand.